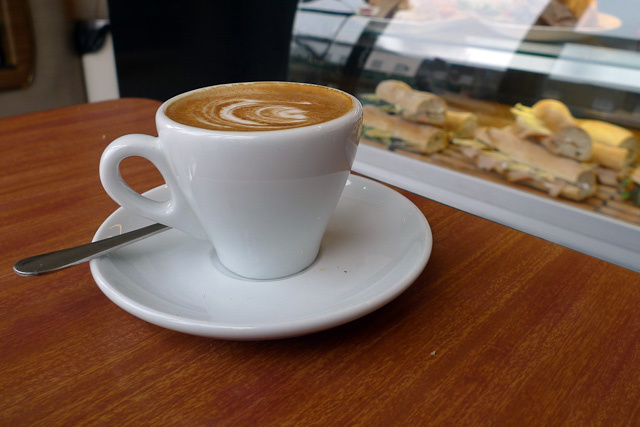 Our continuing, caffeine-fuelled quest to explore the finer coffee shops in London. Packed into a challengingly small space on Hackney Road, Taste Of Bitter Love may share a name with a lachrymose song by Gladys Knight and the Pips, but the experience is anything but heartbreaking.Serving typically excellent coffee from Square Mile, alongside freshly made sandwiches and a decent selection of pastries, this compact coffeehouse offers one of the friendlier welcomes you'll find on the Hackney-Tower Hamlets border.TOBL succeeds in creating a charming and welcoming vibe in its tiny location. On our visit a selection of Eighties rap numbers tweaked from the cafe's speakers, a near-nostalgic touch complemented by a selection of books similarly dating from the decade that taste forgot, including a his-'n'hers workout manuals (by John Travolta and Jane Fonda, respectively), and a dated guide on how to stop smoking. The shop is kitted out with the sort of random antique bric-a-brac common to markets in the area, but instead of an offputting holier-than-though hipster coolness, the place is warm and inviting, with the sunny Australian staff happy to shoot the spit with customers.On the Tuesday morning we visited most visitors were getting take-away coffees, and with only three tables indoors and another pair out on the pavement for observing the daily grind of Hackney Road pondlife, getting a seat isn't guaranteed. But if you're in the area it's an ideal pit-stop, and being just a five minute walk away from Columbia Road, it's definitely worth the small detour next time you're at the Sunday flower market. You might even be able to pick up an antique vase for those petunias you rashly bought.See previous entries in the series.Taste Of Bitter Love, 276 Hackney Road, E2 7SJ. Open 7.30am - 4pm Mon-Fri, 10am - 3pm Sun. Closed Sat.